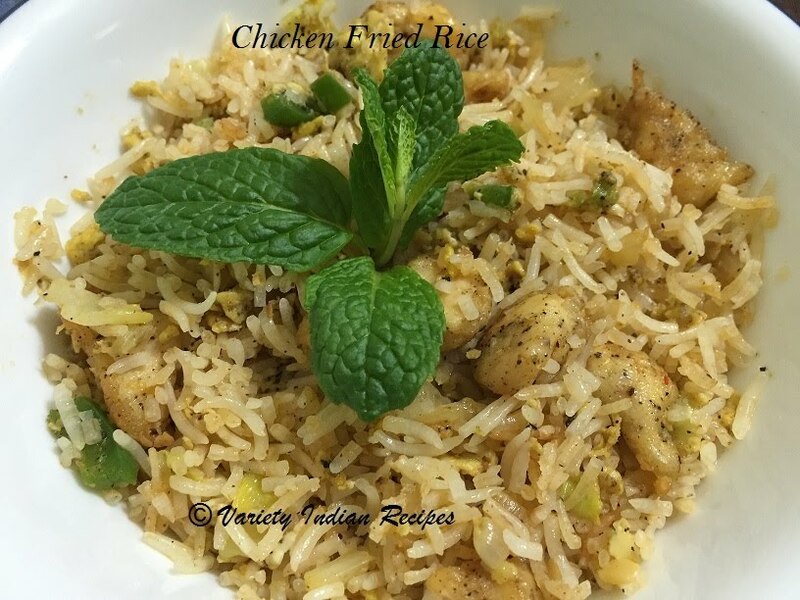 Chicken Fried Rice posted here is a Indo Chinese recipe. Fried rice is a dish where steamed rice is stir fried with vegetables, meat and mild spices. Left over rice also works great for preparing the Fried Rice. This is a universally appealing dish, and delicious too. Mix cornflour, pepper powder, salt and 1 egg. Add the chicken pieces to it and mix well, allow to marinate for half an hour. Wash and soak rice in 1 cup rice : 1 and a half cup water ratio for 30 minutes. Cook rice and keep aside. Finely chop onion,ginger, garlic, celery and spring onions. Cut the vegetables finely so that they can cook easily. Take oil in a pan, add the marinated chicken and fry till it becomes crisp and set aside. In the same pan, add the finely chopped onion, ginger, garlic and celery and fry. Add egg and a little salt and fry. Add carrot saute them until they are crisp. Now add capsicum and saute well. Finally add cabbage and saute till the cabbage is tender and crisp. Add soya sauce, pepper and stir well, now add the fried chicken, cooked rice, also add the required amount of salt (Note a little salt was added already for cooking the vegetables, so add the salt accordingly). Garnish with coriander leaves and spring onions and serve hot.